There’s no getting away from it, with shorter days and colder mornings as we head into winter, it’s becoming progressively harder to leave a warm bed and pedal off into the dark. I do at least have a solid excuse for the madness though – if I don’t train, LEL will be an impossible task. Penny and Henri don’t have that motivation. Their only reason to drag themselves from the comfort of home at 5am on a cold and foggy Saturday morning was to come out and support me. But still they were there, and with smiles and enthusiasm. Dark riding was something new for Penny, and I know she had been a little nervous, especially with the fog. Having Henri ride safety on his scooter for the first 50km was a great boost though, as were the superb array of front lights we sported. Between my Edelux and Lezyne, and the MagicShine Penny had the road ahead was positively floodlit. 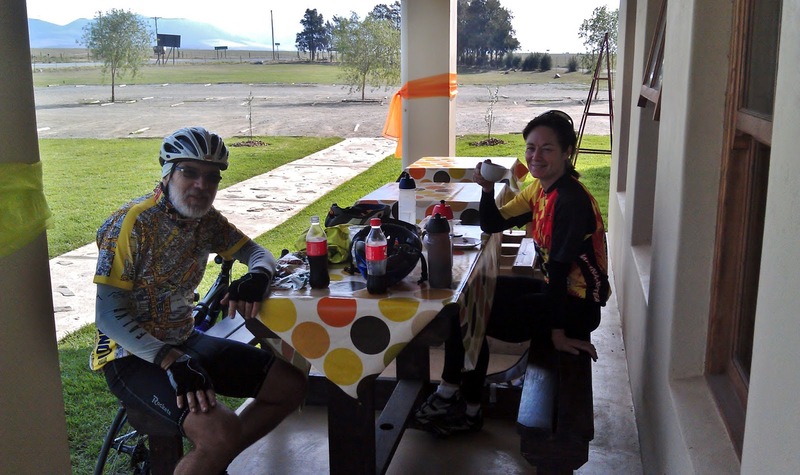 By the time we looped back just short of Jonkershoek gate, the nerves had gone and Penny remarked how wonderful it was riding on empty and peaceful roads in the quiet of the early morning. Henri wasn’t enjoying it quite so much behind, sat static on a scooter, he was feeling the cold without the exercise to generate some warmth. A dim, misty dawn was breaking through on the last stretch back to Somerset West, pale and serene. The 7am group of Wannabees riders passed us just after we’d climbed back up Koosie. I’d miscalculated our time and turned us around prematurely though, and with no incidents on the return leg we were back at Waterstone half an hour early for the second, main loop of the day. Whilst Henri whizzed off to swap scooter for bicycle, Penny and I made for the warmth of the BP garage cafe. Shedding layers as we sat down to hot chocolates and coffees, I was surprised how wet I was – a combination of the effort of exercise inside the cold weather gear, and the damp fog that had persisted through our early riding. At least we were inside, and the staff of the garage didn’t seem to mind us propping our bikes up inside to ensure we had something to ride for the second lap. All to soon we were back out again, and Henri was waiting in the car park, now sporting full cycling gear. At 8am we called it, no other riders had shown so we started off again now three riders against the cold. 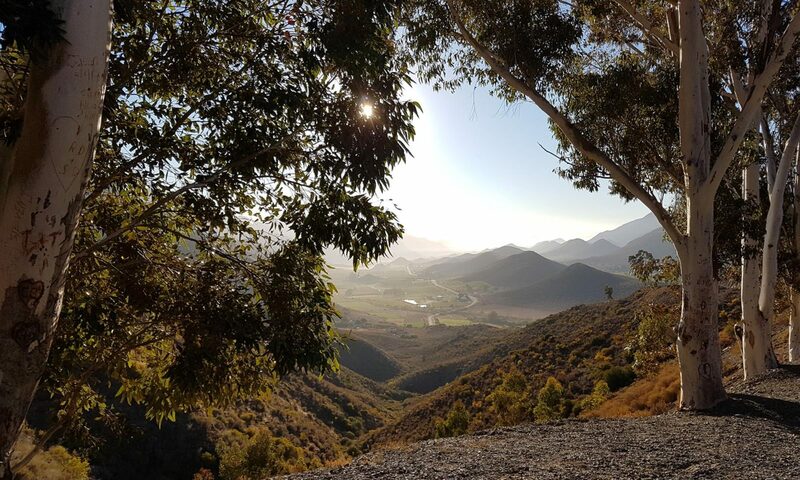 With the fog still thick, we abandoned the original plan of taking the Kuilsrivier road and up over Vlaberg, choosing instead to head back inland again towards Stellenbosch where the fog had been much thinner. Fortunately the weather was confounding the forecast, and once over the Lord Charles hill we were greeted with a stunning blue sky morning across the winelands. 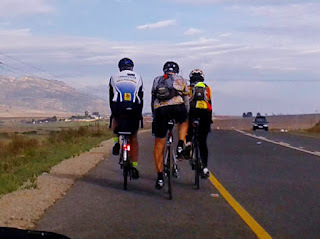 We were quickly through Stellenbosch, and heading up Helshoogte. The guys took it very easy on me and my extra heavy bike, and we span up slowly and easily in light gears. And after a brief stop for snacks, we sped down towards Pniel. As we descended so did the cold and the mist, and the sunglasses we’d broken out at the top of the hill were soon stashed back in pockets. At the T junction beyond Boschendahl, Henri suggested we take the longer Drakenstein route to Paarl, and catch up our missing kilometres earlier rather than later in the day. It was a good call in terms of overall ride strategy, but it was also an uncomfortable diversion as we bumped and bounced along the dreadful corrugations. So much for a new road surface, they really shouldn’t have bothered, the old tar was a far nicer cycling experience. It occurred to me as we finally left the ghastly bone shaking section behind us that I hoped they didn’t revert Die Burger back to this route now that two years of roadworks had gone, leaving behind their excruciating excretia. Paarl brought with it both a reminder of last month’s Monster Reloaded, and also the familiar and welcome site of the Spa stop we’d used during DC training. Henri and Penny headed to grab the coffees, and I ducked inside to stock us up on water and grab a Full Cream Milk for Penny – one of her allowed energy sources, being on a no carb regime. Having no such dietary strictness, I devoured a hot cross bun, and half a peanut butter sandwich. 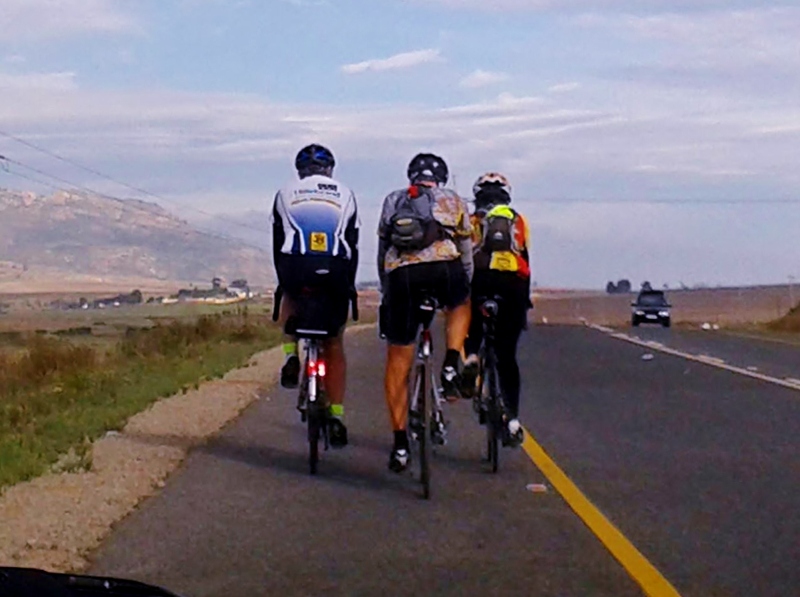 The coffee hit the spot, and we all decide to lose our jackets and head out again through Paarl in jerseys and arm warmers. It was still chilly though, and for the first kilometre or two it felt like we may have made a mistake. 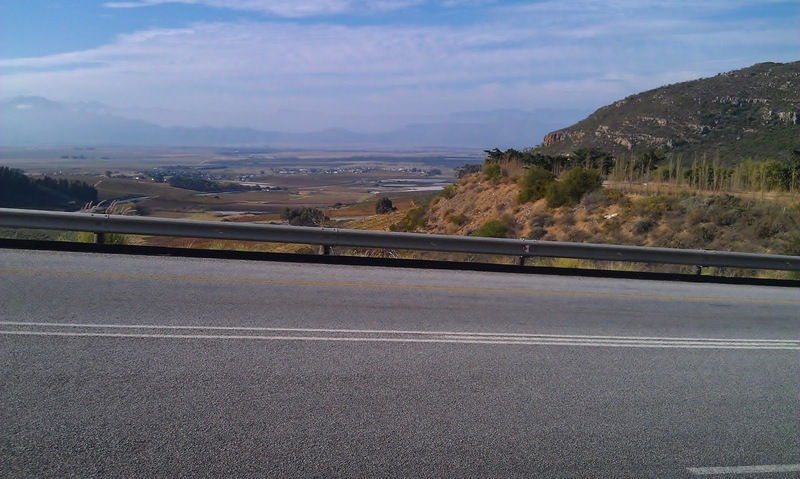 But the Boland and Swaartland winelands are generally warmer than the coastal region behind us, and that coupled with the renewed effort of cycling, it wasn’t long before I started to feel warm again, and the damp from earlier slowly dried out. The Monster had taken along this exact same route, but it looked different in daylight, and in reverse. With no need for water or fuel, Wellington came and went without a stop, and we battled out against a freshening North Wester towards Riebeek Kasteel. Coupled with a succession of steady rollers, it made for a fairly strenuous section of the ride. At some point Henri suggested I duck behind and draft a while. We did alternate a few times, all of us taking up our share of the workload. But I couldn’t sit behind being towed, it would defeat the whole point of me training, so quite often I found myself moving to the front. out to stop for a snack, as luck would have it he did so alongside a padstaal I’d noticed coming the other way on the Monster. 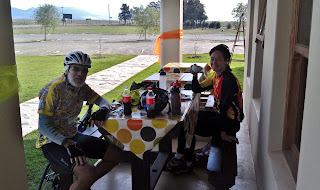 So with wheels scrunching along the gravel drive, we ducked in for coffees, cokes and a snack. The owners were extremely friendly, and I made a mental note that this could be a nice lunch stop on my planned outride to Yzerfontein in July. Back on our way again, the majestic and slightly daunting climb of Bothmaskloof lay ahead of us. It’s not particularly steep, or particularly high, and I’ve done it a number of times before with no problem. But even so, it looks no less challenging as you steadily grind up the opening slopes, with the long sweeping curve of the climb in full view ahead. It was no surprise to see the guys gradually edging ahead, as I geared back to my granny ring. Even in my lowest gear, the climb wasn’t easy on tired legs, and I found myself alternating sitting and standing to haul my juggernaut up the pass. The guys waited for me just before the summit, which also meant we could enjoy the stunning views back down into the valley we had spent the last hour or so cycling through. It was a good call, because although scenic, the views once over the pass are considerably less impressive. The descent towards Malmesbury was fast and glorious, even the few rolling sections hardly seemed to trouble our pace. It was clear by now though that we were against the clock in terms of daylight hours for the rest of the ride. 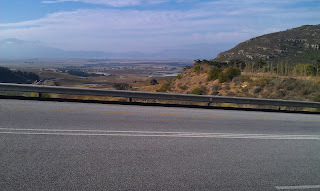 Just before reaching the town the road crossed over the track of the AMARider 100 miler mountain bike race. We paused briefly and cheered a couple of tailenders along as they rode under the bridge, but didn’t see any of our club mates who were riding. Soon after we were in Malmesbury and headed to the Engen garage to quickly top up on water, and put some fuel in our bodies before the last stretch home. Whilst stopped, we had picked up a call from Adele with a somewhat confusing message that they’d be joining us. As we rode out of town, the meaning became clear. After a family ride, they had driven out to cheer us on. It was great to see some familiar faces and get words of encouragement as they drove alongside us for a while. With late afternoon shadows lengthening though, we had to bid our goodbyes and step up the pace. Luckily now the North Wester was at our backs, and the road surface was some of the smoothest tar we’d ridden all day. We fairly sped along. I lost count of the number of times I looked down in surprise at seeing my speedo clocking 30km/h, 35km/h, sometimes more. Later, when I looked on Strava, it turned out we’d averaged 25km/h for the whole 50 kilometres, and set the 9th fastest time recorded for that stretch of road. Not bad for a trio of riders with 200km in their legs. And that average speed included stopping to mend a puncture when Henri picked up a thorn in his rear tyre. Who knows, we might even have made top 5 but for that! “Stellenbosch in daylight” had been Penny’s request, and we did one better than that. We made it by sunset, and still had a few rays of daylight as we headed out of Stellebosch for the last familiar kilometers home. It was fully dark by the time we reached Koosie for the second time of the day, and with both Henri and Penny’s front lights now dead, it was down to mine to light the way. Luckily, with a bit of foresight I’d swapped the Lezyne battery at the Engen in Malmesbury, and we had plenty of light for that last, short but steady climb of the day. I remarked as we climbed which of our times would be fastest, this, or the first loop at 7am. Something I still need to check. With nothing more than the blast down the R44 left, Henri sped off into the distance. Clearly his night vision was better than ours, and we descended with a still fast, but more measured pace, guided by the shared pool of light. Back in Waterstone car park, the Garmin read 256km – Henri’s early detour had done the job and we were back on quota for the day. Somewhere out on the R304, we’d crossed 200km, making this Penny’s longest ride to-date, the satisfaction now evident from her broad smile. Perhaps the biggest achievement from my side was finishing feeling fresh and strong: my lower back pain and elbow pain that I’d started the ride with hadn’t affected the ride, or got worse; and the numb hands from the last ride seemed to have been cured, perhaps by the lower tyre pressures, or maybe just the conditioning of being now more used to the distance. The real difference on the day though was the company. Riding along with good friends and lively conversation had made this ride a pleasure, rather than just a gruelling challenge. A timely confidence boost in my preparations for LEL. A huge thanks to my awesome club mates for that.